Hamilton, BERMUDA: Sept. 30, 2012 – Ian Williams (GBR) Team GAC Pindar, fresh from a first place podium finish in Match Race France, leads the pack as the number one seed in the Argo Group Gold Cup. Williams is the top ISAF ranked sailor in the world and now stands first on the Alpari World Match Racing Tour (AWMRT). He will lead Group 1 in the round robin competition to select four Qualifiers for the Quarter Finals. Bjorn Hansen (SWE) Mekonomen Sailing Team was the Alpari World Match Racing Tour leader before being eliminated without Tour points in France. He is currently second in ISAF rankings and is the number two seed in the Argo Group Gold Cup. He will lead Group 2 in their round robin Qualifying matches. Joining Williams in Group 1 will be Will Tiller (NZL) Full Metal Jacket, his opponent in the Finals of Match Race France. This should be a continuation of the rivalry just initiated in the 2-0 match Williams won over Tiller in France. Also in Group 1 are top-20 sailors Taylor Canfield (ISV) of Team CMRC ranked 11by ISAF, Staffan Lindberg (FIN) ranked 19, and Marek Stanczyk (POL) ranked 20. Johnie Berntsson (SWE) Berntsson Sailing Team, as ISAF sixth ranked match racer, is the second seed in Hansen’s Group 2. Berntsson was also eliminated early from Match Race France. He and Williams are past Gold Cup Champions. Other top 20 match racers in Group 2 are Eric Monnin (SUI) Oklays Corum Sailing Team at 13 and Nicolai Sehested (DEN) ranked 15. Adam Minoprio (NZL) Team Argo Group has recently returned to ISAF match racing on the Tour after more than a year off for a stint with ocean racing. As a past Tour champion and as a two-time second place finisher in the Gold Cup, Minoprio has been ranked in the top eight for the gold Cup and seeded fourth in Group 2. In the 2012 Argo Group Gold Cup, the two–group round robin qualifying stage means that all 10 teams in a group will sail against each other once. The top four teams in each group will move up to the Quarterfinals. There is no second chance this year. Tour sailors will make a quick trip from France to Bermuda for practice on Monday and first racing on Tuesday morning. The Argo Group Gold Cup is a classic, the largest event on the Tour and a founding member. Twenty teams including Alpari World Match Racing Tour Card Holders and the world’s top match racers are invited. Four more teams are automatic qualifiers as winners of the Detroit Cup, the Knickerbocker Cup, the Dutch Match Cup and the Bermuda National Championship. In 2012 the winners of three of these events had already been invited to Bermuda and could not be replaced late in the summer. The field this year is 20 teams as opposed to the usual 24. Final registration for the Argo Group Gold Cup opens Sunday September 30th, and practice sessions are scheduled for Monday October 1st. Racing begins the next day and continues with the Finals and Petite Finals scheduled for Sunday October 7th. The finals, scheduled for 14:00 local time (ADT/GMT-3) will be televised live and online. The schedule will be available pre-event at www.wmrt.com/live and on www.argogroupgoldcup.com/. Other highlights for the week include the Renaissance Re Junior Gold Cup, which features the top Optimist Dinghy sailors from 15 countries racing against a contingent of Bermuda’s best young sailors. This ‘Championship of Champions’ celebrates its 10th Anniversary in 2012. The annual Family Festival of Sail is also scheduled for Sunday October 7th in Barr’s Bay Park adjacent to Royal Bermuda YC and is open to all. This year will mark the 62nd staging of the King Edward VII Gold Cup, with previous winners including some of the greatest names ever to match race. Since the event was reformatted to be an event under the Match Racing Association in 1985, multiple winners include Chris Dickson (NZL), Russell Coutts (NZL), Peter Gilmour (AUS), and Ben Ainslie (GBR). The 2012 Argo Group Gold Cup runs from October 2nd with Finals scheduled for October 7th. 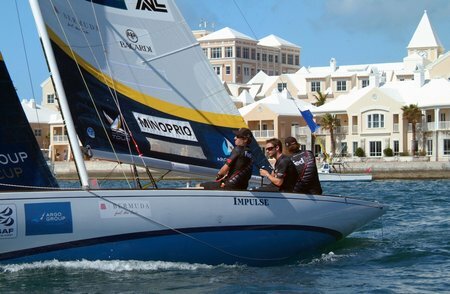 Spectator friendly racing is held in Hamilton Harbour, adjacent to the Royal Bermuda Yacht Club Marina, a spectacular attraction for tourists and Bermuda residents alike. The Argo Group Gold Cup is the penultimate seventh stage of the Alpari World Match Racing Tour, in which the teams compete for the ISAF Match Racing World Championship. Match racing for The King Edward VII Gold Cup is recognized as one of the classic heritage events on the Alpari World Match Racing Tour.